We have so many of these we decided to give them their own section! If you love Bob Marley, you've come to the right place. Here you will find DormCo's selection of Bob Marley College Wall Decor to add to your dorm room decor. Part of college living is expressing your interests through your dorm decor and dorm wall art. If one of your interests is Bob Marley, then you're in the right place to find some unique dorm room decor to make your dorm room feel like home. 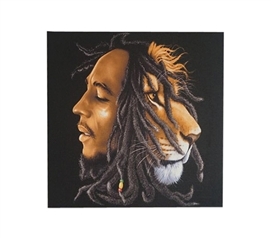 If you're looking for Bob Marley Dorm Wall Art but want something unique for your dorm decor, you've found the right section. These dorm essentials are lightweight and can either hang on your dorm room wall for college wall decor or sit on top of a surface in your dorm room for a one of a kind finishing touch to your dorm room decor. Here at DormCo, we provide you with the unique college supplies you need to make your dorm room feel like home right down to these painted dorm wall canvases of Bob Marley.